Great for sensitive tummies. A super quick and free FODMAP pesto the whole family can enjoy. Remove the stalks from the basil and add the leaves to food processor. Add the pine nuts, almonds, lemon juice and zest and olive oil. Finally blitz until a fine consistency. 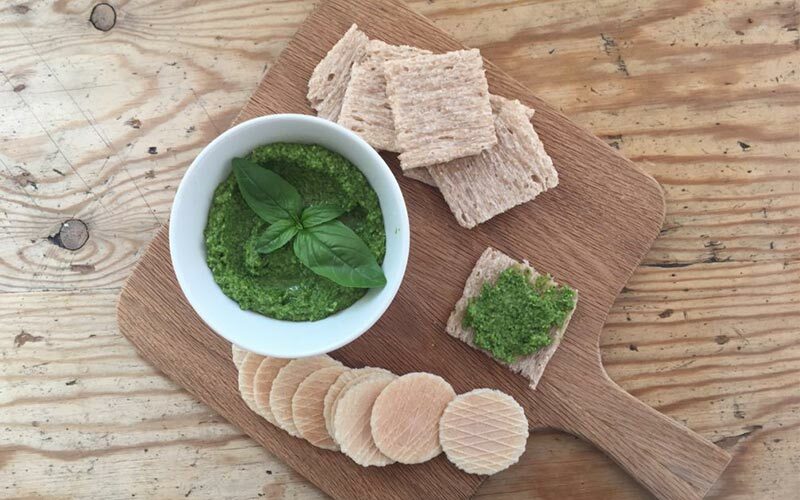 Take some of the FODMAP Pesto and add it to freshly cooked pasta for delicious meal or serve as a dip with low FODMAP crackers. You can freeze the rest for future meals. Want to know more about a low FODMAP Diet? Check it out. This diet is perfect for sensitive tummies and IBS sufferers. If you want to learn more, you can take one of our Eatfit Courses, or get in touch with Sasha.